Kiev resumed its military assault in eastern Ukraine on Sunday despite receiving a proposal Thursday night from the Russian president that both sides of the conflict withdraw their heavy artillery, Putin’s press secretary said. "In recent days, Russia has consistently made efforts to mediate the conflict. In particular, on Thursday night, Russian President Vladimir Putin sent a written message to Ukrainian President Poroshenko, in which both sides of the conflict were offered a concrete plan for removal of heavy artillery. The letter was received by President of Ukraine on Friday morning," president’s press secretary, Dmitry Peskov, said as cited by RIA Novosti news agency. 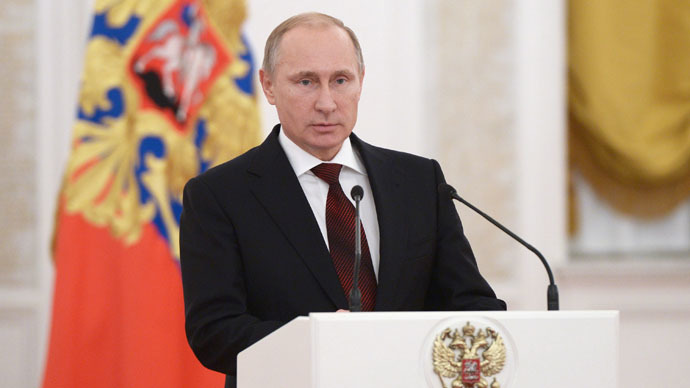 “The latest developments in Ukraine connected with the renewed shelling of populated areas in the Donetsk and Lugansk regions cause grave alarm and put in jeopardy the peace process based on the Minsk memorandum,” Putin’s letter reads. Putin suggested the immediate withdrawal of artillery with a caliber more than 10mm to the distance defined by the Minsk agreements.Russia is ready to monitor the fulfillment of these moves jointly with the OSCE, the letter concludes. “We are deeply concerned by the fact that the Ukrainian side continues to increase its military presence in the southeast of the country in violation of the Minsk agreements,” the ministry said in a statement. The order from Kiev came after several days of violent clashes at the ruins of Donetsk International Airport – a scene of constant fighting over the months amid a shaky ceasefire between the Ukrainian army and local militia forces. It was also the scene of a deadly bus shelling earlier this week; 12 people were killed on Tuesday when the bus was targeted at a Kiev-controlled checkpoint near the town of Volnovakha. DNR forces denied accusations that local militia were responsible, saying the bus was targeted by Ukrainian troops. A sharp escalation of clashes has also been reported across the frontline in Donetsk and nearby regions. Russia has urged all members of the international community, specifically the OSCE, to demand that Kiev unconditionally give up its policy of forced suppression of the conflict. “There is an urgent need to cease hostilities and resume the 'silence' mode in Ukraine; the OSCE mission should play a special role in this,” the statement reads. Moscow has stressed the necessity to continue talks within the contact group to fulfill the Minsk agreements, saying it will do all it can so that the group can meet at the beginning of next week. “We are calling on all members and those who have influence on the situation, to not let another breakdown [in talks happen],” the Foreign Ministry said. Russia has expressed readiness “to use its influence on militia” in southeast Ukraine so they voluntarily agree to withdraw heavy armament from the frontline, so that its geographic coordinates correspond to Kiev's demands "to avoid more victims among the civilian population." The Foreign Ministry has linked the deadly attacks in Donetsk and Kiev's “massive fire” order with the upcoming EU Foreign Affairs Council meeting on January 19.